This is the story of how the ultimate reluctant reader became a book lover. The little boy in I Will Not Read This Book has a lot of excuses, because if there is one thing he doesn’t want to do, it’s read this book. He won’t read it even if you hang him upside down by one toe, over a cliff, with sharks down below. And you know what? You. Can’t. Make. Him. 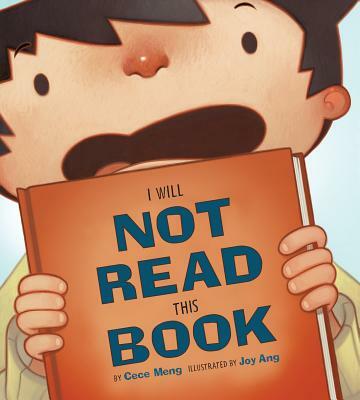 In this book illustrated with wit and whimsy by Joy Ang, Cece Meng delivers once again with a pitch-perfect reluctant reader who is finally convinced to read the book if—and only if—someone he loves will read it with him. Joy Ang has illustrated many picture books in addition to the Mustache Baby books, as well as the NYT best-selling The Atlas Obscura Explorer’s Guide for the World’s Most Adventurous Kid. She lives in Bellevue, Washington.